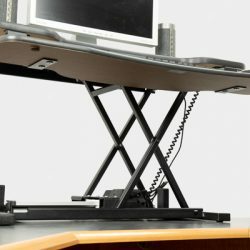 VersaDesk Power Pro standing desk is possibly one of the best standing desk converters on the market right now. Excelling in both features and quality, it certainly has a lot of “bang for the buck”. 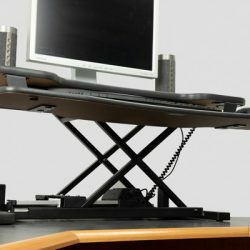 The VersaDesk Power Pro standing desk is a standing desk converter that sits on top of your desk and provides a means of raising your work surface so that you can either sit or stand at your desk and work at your computer. 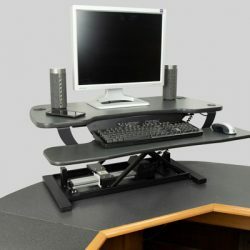 Unlike many other standing desk converters, it features an electric drive mechanism that raises and lowers it at the push of a button. 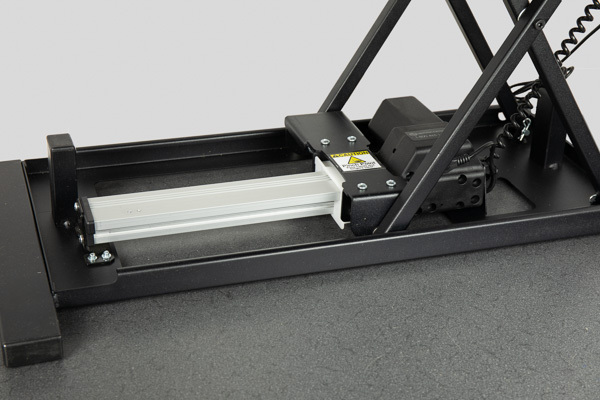 This feature is slower than a manually operated desk but provides ease of use – especially for people with bad backs, such as myself. 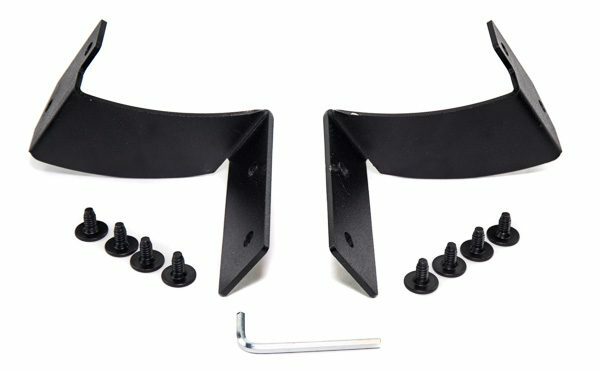 The VersaDesk Power Pro comes almost fully assembled, you simply install the keyboard shelf brackets with four screws, and then the keyboard shelf with another 4 screws. The main mechanism is already assembled. From the start, I could tell that this is a well-built product. Both the fit and finish of the product exude quality. The work surface is basically the same material as a countertop, unlike some other brands that are simply painted wood. 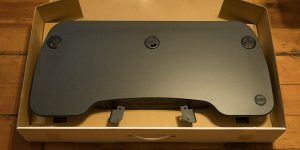 The desk has three standard 2″ grommet holes that are compatible with most universal monitor mounts, and can also be used to neatly route wiring for anything that’s on the top. 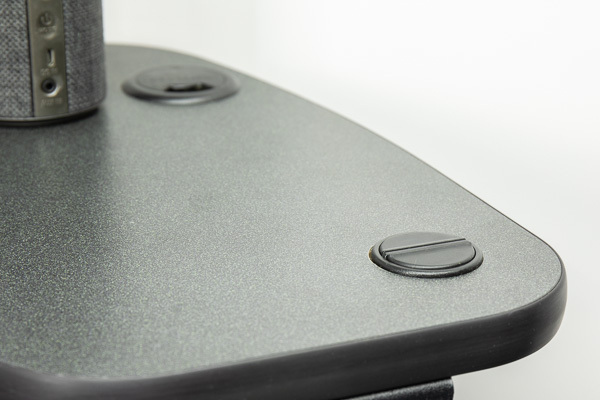 The grommet holes have plugs, so things won’t fall through if you’re not utilizing them. The first thing I noticed was how sturdy it was. I really expected it to wobble or flex more than it does. The next thing I noticed was how high it extends. Although it extends up to 20 inches, I found that I only raised it 12 to 13 inches, and I’m 5′ 11″. It can accommodate someone up to 6′ 4″ tall. It is available in a variety of colors, I chose the “Black matrix” because it almost perfectly matched the top of my desk. It is also available in white, gray, and maple. 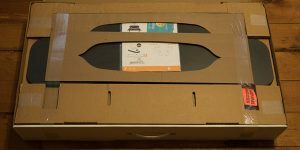 It is available in 30″, 36″, 40″, and 48″ widths. Although with my back I don’t stand and work for very long periods, I did find it useful for the times where I’m working around the office and going to and from the computer often. Not having to either sit down or bend over to use the mouse and keyboard was a real relief. + Video section of the website includes a video on how to assemble the desk. + Auto up and down. Although it would add to the price, it would be nice to have an auto up and down function. It would be nice for the desk to go up and down while you’re running off to get some coffee. + No cable routing. You’re pretty much left to yourself on figuring out where to run the cables for your computer equipment. Although a few zip ties help, it would be nice if it included some kind of cable routing solution to both make it easier and neater. 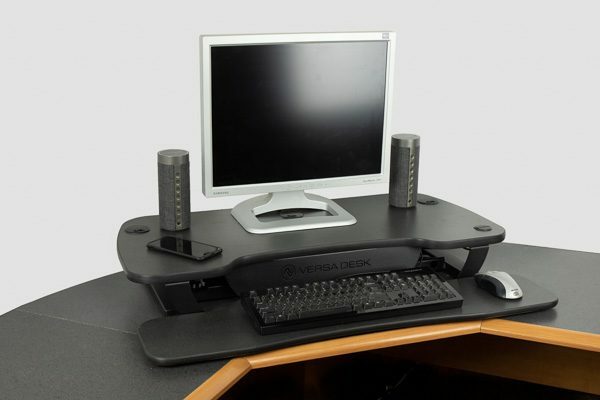 The VersaDesk Power Pro just seems like one of those items that will last a lifetime, it’s that well built. You know that feeling you get when you feel like you got your money’s worth when buying something? This is one of those things.